It’s been four years since the first and only showing here of Penstemon cobaea, called wild foxglove, prairie penstemon, showy beard-tongue, large-flowered beard-tongue, dewflower, wild belladonna, and fairy thimbles. On April 8th I photographed some of these flowers on two properties close to the intersection of Greenhill Dr. and Old Settlers Blvd. on the Blackland Prairie in Round Rock. I couldn’t decide whether to show you the flowers in isolation against the clear sky or with a piece of the prairie behind them, so you’re getting both. You know what the flowers in the background below are. Hi, guys. Good to hear from you, and good to hear that you’re awash in flowers over there. Over here we’ve been awash in wind for the last few weeks. A sudden storm last night knocked out the electricity in this part of Austin for an hour. That beautiful tiny bit of prairie is totally covered with concrete now, even the section just to the east.I had my eyes on a stand of Gayfeather that I had hoped was protected from the bulldozer because of its location. Nope! I should have known! I wish I had rescued when I first spotted them.. . I was going to report to you that another piece of the original Greenhill prairie is under construction to the east along Old Settlers now, and that there’s also new construction on the east side of Greenhill going south. I should have known you’d already know. We’ll all always remember that corner the way it used to be. Sorry you didn’t rescue your gayfeathers. Maybe you can get some from the rescue site along Old Austin Pflugerville Rd. 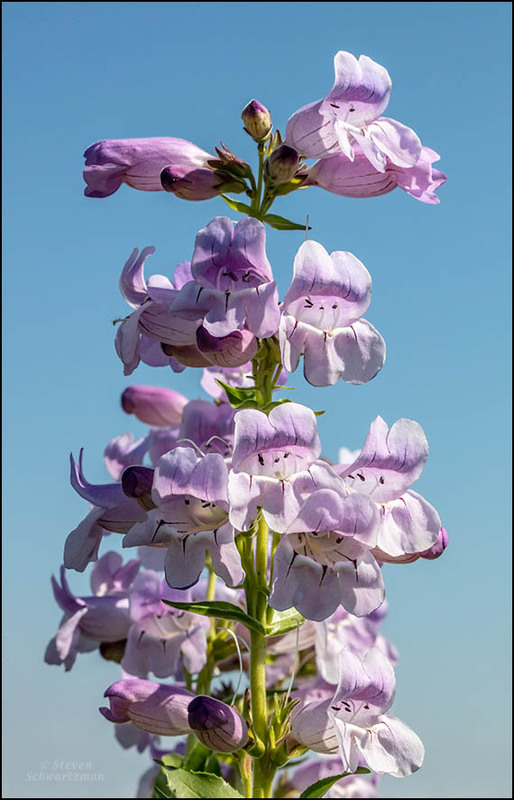 I live in an arid rocky part of British Columbia and cultivated, hybridized penstemon, and showy beard-tongue, grow very well in my skree-type perennial garden soil. Whereas many perennials only last two to three years, these varieties keep on producing blooms. 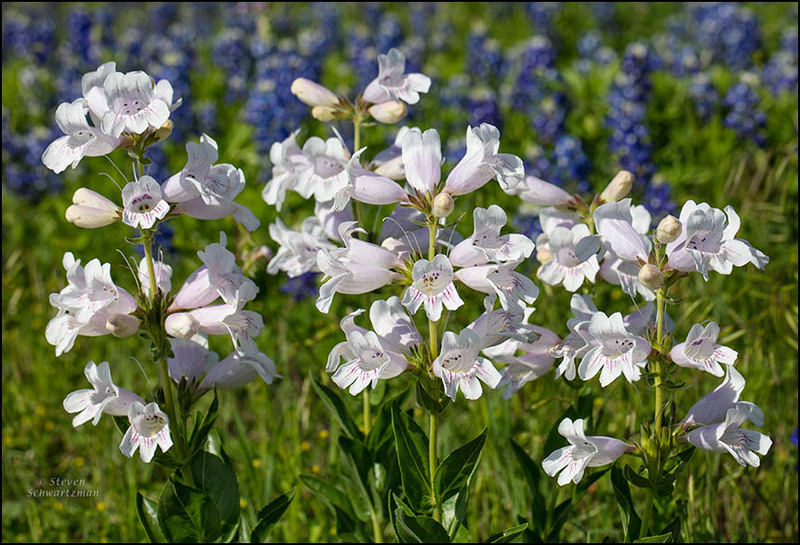 Thank you for featuring these hardy, showy, beautiful blooms in their native state. You’re welcome. Increasingly many of my photographs, including these two, will be able to serve as historical documentation, because as the Austin area continues its rapid growth, the sites where I’ve taken pictures keep getting developed. I appreciate the dual sense of your phrase “in their native state.” As for hybrid penstemons in British Columbia, that’s more your province than mine, given that my limited knowledge is about native species in central Texas. That said, I can see why gardeners would be happy with the extended bloom period of hybrids. After a couple of years of thinking I’d seen Penstemon in my area, I finally found my photos and realized what I’d seen was spring obedient plant (Physostegia intermedia). I do think I might have found this plant on the Willow City loop, although the markings are somewhat different. Yours show multiple little slashes on that lower ‘lip,’ while mine have only single lines. A Kansas wildflower site shows flowers with the same markings as the ones I found and calls them P. cobaea, so it may be a natural variation. The ones I found were pretty raggedy, so its nice to see some in their full glory. Full glory, indeed. It had been years since I’d come across as many nice specimens of this species together in a relatively small area. I’ve always found Penstemon cobaea hard to photograph because the flowers point in various directions and because it’s hard to keep all the parts of each “bell” in focus. It’s good to hear you’ve identified the obedient plants in your area. I find the various Physostegia species difficult to identify. Marshall Enquist includes three of them in his book. I’ve noticed that within any species there can be plenty of individual variation, as with people. Plenty of times a plant that I find in the wild, and that I know the identity of, looks different from some of the pictures of that species in field guides. Thanks, Pete. You’ll appreciate the amount of lying on the ground and contorting myself that I had to do to take these pictures. I sure do, Steve, and you are very welcome! The only way I can think of to have gotten a better version of the first photograph would have been to dig a hole alongside the flowers so I could get lower for a more upward look. Absolutely one of my favorite spring wildflowers!! At the Wildflower Center yesterday there were several scattered in the field near the auditorium…..and another rarely seen subject, blue curls, were in full bloom….would love to see those grace your pages. What beautiful flowers, Steve. Terrific images and information. Hi, Jane. Welcome to the Blackland Prairie in central Texas. I welcomed another chance to showcase this native wildflower. It has way too many names! It sure is pretty though. I have not found one that I do not like. I found all those vernacular names for this species on the Internet. I can’t vouch for how often anyone still uses them. As you say, regardless of the name, the wildflower is pretty. Those are gorgeous! We have several species here too, but much later in the summer. I love the color of these! Especially pretty! Given your colder climate that pushes a lot of flowerings later into the year, I’m still surprised that you’ve shown at least at least a few wildflowers that appear as early in the year as some of the ones here. Those early ones can not survive the high temperatures of summer. Interesting adaptation. Seems like there’s a niche for almost everything. Lovely to see both photos but it is the top one which appeals the most to me. I see little faces peering from the flowers. I’m with you in preferring the first photograph, which I think of as more artistic because more abstract, and for which I had to strain to get the camera as low as possible. The second photograph is better documentation of a prairie, but unfortunately of a prairie that is gradually disappearing. Happy little faces to you. My face is not happy though over the disappearing prairie. When I started going to this piece of prairie in around the year 2000, it was larger than it is now. First came an office complex at the corner of the intersection. Last week I found that the adjacent plot is under construction, and a building had already been added further down on the property. Some unbuilt land remains there, but probably not for much longer. When I moved to this area in 1976, Round Rock’s population might have been 8000. By the year 2000 it had risen to 61,000. The current estimate is 112,000. My goodness. I suppose the same expansion has happened here. When I came to Christchurch in 1999 I knew almost every part of the city and its suburbs. Parts of it, today, especially the outer suburbs, are like foreign territory to me. Then that’s one more thing we share: when I drove through the outer parts of Christchurch, they seemed like foreign territory to me, too. This local foxglove, like yours, is pretty good at reseeding itself. Unfortunately so much land has gotten developed and continues getting developed that our foxglove’s habitat has kept shrinking. This is indeed a lovely offering. I particularly like the second shot showing it in community. One summer I saw a small colony of this blooming its heart out at Illinois Beach State Park and got all excited. I think it isn’t native here, though, and was probably sprayed before it could spread because I haven’t seen it since. When I was first starting as a naturalist I was fully onboard with the strict “only native” rule but with climate change and habitat loss, I’m beginning to think we might be wiser to embrace anything that will thrive. Well. Except for buckthorn and reed canary grass. And kudzu. “In community” is a good way to put it. Species can and do extend their ranges. For example, maybe a dozen years ago I came across a source from the 1800s that gave the range of buffalo bur, Solanum rostratum. Today it has a much broader range. This isn’t the sort of plant that people would have chosen to cultivate in new places, so I assume it spread on its own, or more likely with inadvertent human help. For example, its seeds might have gotten mixed in with grain shipments or blown into wagons of people who were moving long distances.